Its been raining here for 24 hours now and any time it stops, it is just for a brief moment. The pauses are long enough for one to step outside and take in a breather; a smoke; a stroll around the shelter, be it a shack or a sky scrapper. They are long enough for one to do whatever they need to do in between sessions of rainfall. For me it is a breather. I have always love the smell of wet earth and recently, the smell of the ocean breeze has become an acquired taste. So I don’t mind the sea front rain. It doesn’t beat down as hard as it does further inland. There are no gustly winds to survive, jus water droplets that gently cover the surface of any thing impermeable they happen to fall upon. On the car outside, they just happened to form blanket of diamond like crystals. As I walked passed feeling tempted to run my fingers across and draw a line through the blanket of droplets, I noticed an odd one. They were all clear like crystal but this one was red and shiny. 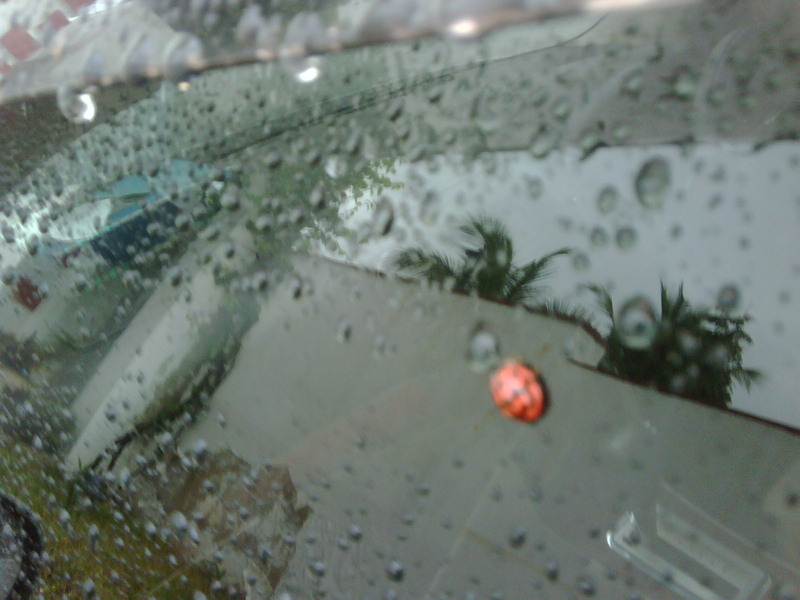 Under the gloomy grey skys above, this little red spot was like the sun; trapped in a droplet of water and sent down. It wasn’t magnificently brilliant or anything, just conspicous. When I was a small boy, I used to love Ladybirds. They were all over and came out way before the rains. With the currents unpredictable weather and climate change, I guess these little buggers are very confused on when to turn into what in their cycle. I went to that site to learn some more about the little thing. I was reminded of the song we used to sing to the ladybird. It was one of the few bugs that no one wanted to kill. It had a magical aura about it and seeing it today, took me back. There is no real lesson or revelation to this article. Just a child-like appreciation for a creature that I thought ceased to exist.